Get an early start on the day with pickup at your accommodations in Makarska: pickups begin at 6:45am, but exact departure time will depend on your location. You’ll follow the coastal road to Dubrovnik, passing a series of scenic, seaside villages with views of the islands and the Adriatic Sea. Upon arrival in Dubrovnik, get your bearings with a guided sightseeing tour of the Old Town. 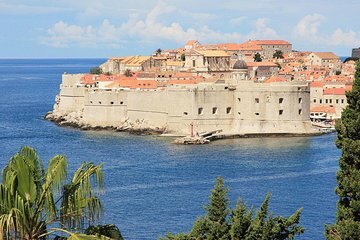 Your guide will share stories about Dubrovnik’s fascinating history and rich culture, pointing out landmarks of Gothic, Renaissance, and Baroque architecture. “The Pearl of the Adriatic” was a powerful force starting in the 13th century, and the picture-perfect old town has survived a powerful 17th-century earthquake and shelling in the 1990s. Following the 2.5-hour city sightseeing tour, you’ll have two hours to enjoy the town on your own: head to the water to soak up the sunshine, settle into a picturesque café for lunch, or keep walking the historic streets, where you’ll find boutiques, galleries, and museums to explore. At 4pm, meet back up for the return trip to Makarska, then finish the day with drop-off at roughly 7:30pm.